In this How to Spar for the Street series of articles we are discussing how to make your sparring relevant to real situations. The sparring in most dojos is based on the rules of modern competition and therefore has little in common with real situations. To be clear, I’m not for a second saying there is anything fundamentally wrong with competitive sparring. If you want to win tournaments, that’s how you need to spar. The problem occurs when people mistakenly believe that training for competition also develops the skills needed for the street. It doesn’t. In part one we briefly discussed the nature of real situations and covered two of the keys to making your sparring relevant to the street. In this second part, we’ll be expand our discussion and cover four more of these keys. Important Note: All sparring is potentially dangerous and must always be closely supervised by a suitably qualified and experienced person. If you don’t have such supervision, don’t try out the methods we’re going to discuss! Some situations will start without any warning, i.e., if your awareness wasn’t what it should be or if you are the victim of a well-executed ambush. It can therefore be good training to also have your sparring start without warning. The great thing about this type of sparring is that you are never sure what situation will develop or when. You may quickly respond to the command and attack a class mate, only for someone else to attack you from the rear. One second you thought you had the advantage, the next you’re frantically doing your best against two opponents. After a certain amount of time, the person leading the training will shout, “Stop!” and the students return to whatever they were doing previously. It’s important that the person giving out the commands does their best to ensure that the sparring is unexpected. I’m partial to shouting “Fight!” during water breaks, in the middle of drills, straight after a previous bout of sparring, whilst they are performing push-ups, and immediately after I’ve told them the surprise sparring is over (my personal favourite!). The students quickly begin to expect the unexpected and start to fight well regardless of the situation and position they find themselves in. If you are training as part of a small group, another way to have sparring start without warning is agree that anyone can attack anyone else at any point during the session (you may want to make some exceptions in the name of safety: i.e. agree that you can’t be attacked when handling weights, etc). The lack of the command to start makes the sparring all the more unexpected. It also ensures that all training done between the sparring is done with the correct attitude. If you start doing things in a half-hearted fashion, your partners may very well decide it’s a good time to attack you! As we’ve established, real situations will begin with dialogue or without warning. The distance at which words are exchanged is typically the same as punching distance (Photo 1). So in the case of dialogue, the distance has already been closed when the situation gets physical (people don’t try to intimidate you from 10 feet away!). If a situation begins without warning, then the distance has already been closed. 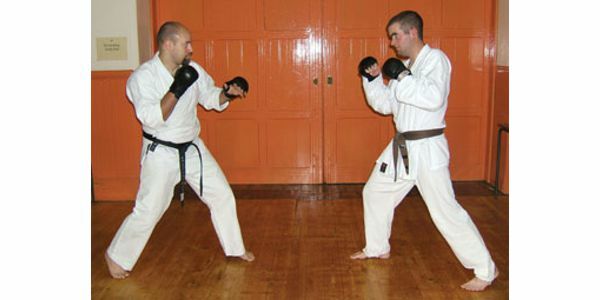 When two martial artists fight in the dojo or competitive environment, they typically begin the fight from outside kicking distance (Photo 2). 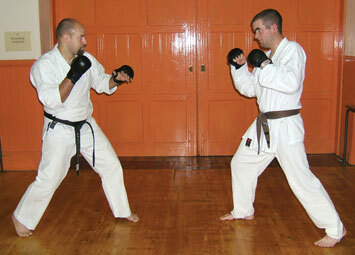 This means that a key part of martial arts sparring is to effectively close that gap. These skills are essentially an irrelevance for the street. Compare the distances shown in photos 1 and 2 and you’ll see that in the street fights are much closer. Another big difference between the street and a dojo exchange between two martial artists is that the there is no back and forth. In the street, people don’t back off, move around for a bit while looking for an opening, before closing the gap again. All of this means that when training for the street we need to exchange techniques at close range (the exception being when we flee, which we will look at later). When you start your street sparring, you should be within arms length of your partner and you should stay at that distance. With practice you’ll get used to fighting at this distance. However, to begin with you may need to force the distance; here are two ways to do this. One of the best ways is to limit the floor space. The students who aren’t sparring form a circle around those who are so that there simply isn’t the space to exaggerate the distance. Another way was introduced to me by Shihan Chris Rowen. Chris simply used a karate belt to tie the students together! It’s a simple method but it works incredibly well. The students can’t exaggerate the distance and hence it forces them to spar at a realistic range. The only downside with this is that the students can’t practise escaping. That said, as a way to isolate close-range skills it’s superb. When you keep your sparring close there are a few things you will learn. One of the key things is that blocking becomes almost impossible. There simply isn’t the time or room to react. This is a really useful learning experience as it brings home the importance of being pre-emptive and proactive in the street. 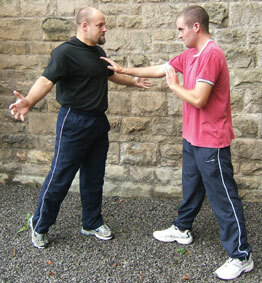 Another characteristic of close-range fighting is that it becomes very important to keep both hands active. Both hands should be either attacking the opponent or setting them up so they can be attacked i.e. setting datums, removing obstructions, etc. As a brief aside, it is for this reason why you don’t see hands held in ‘guard positions’ in kata, but you do see both hands constantly working. Keeping the sparring close is a great way to learn about what is required for the street. So to make your sparring realistic it’s important to start close and stay close. One of the most important things for martial artists to appreciate is that when training for the street trained responses are not a factor. 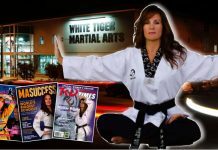 As martial artists we get trained to respond in certain ways to specific stimuli, i.e. when the opponent does motion A; you are trained to respond with motion B. When two martial artists meet these trained responses are invariably exploited: martial artist 1 will move in such a way that it looks to martial artist 2 as if he is attacking with motion A. Martial artist 2 counters with motion B, just as martial artist 1 hoped he would. By responding with motion B, martial artist 2 makes himself vulnerable to motion C; which was martial artists 1’s true intention. He attacked with motion A to illicit a response which would set things up for motion C.
In a street fight, you can’t use trained responses in the same way; hence you need to do your best to eliminate such practises from your street sparring. Trained responses aren’t relevant in the street for two key reasons. Your opponent is highly unlikely to be trained in the same martial discipline as you are and hence won’t react as predicted. But what if he is a martial artist, I hear you cry! 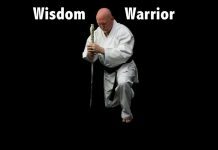 The street is so very different that even if your attacker is a trained martial artist he won’t fight like he does in the dojo or competitive environment. Street fights are far faster, emotional and chaotic than martial bouts. Observe two world-standard martial artists fight and count the average number of techniques thrown in a 15-second period. You’ll notice that most of the time is spent moving around and playing for position. The overall rate of exchange is actually pretty low. Certainly they are likely to be some blindingly fast exchanges, but they are often very short in duration. The ones that last that little bit longer are the ones when a combatant becomes injured or disorientated and the other moves in for a win. In addition to being faster, a street fight is also more emotional. The intense nature of a street situation means that neither you nor your opponent will be best placed to process the information that exploiting trained responses demands. So in the unlikely event that you do meet another martial artist in a street situation, it still won’t be like a dojo or competitive situation. Trained responses aren’t a part of a street fight and hence they shouldn’t be part of your street sparring. The difficulty of course is that you will be training with other martial artists so it initially takes some discipline not to engage in “game play.” The instant you do start trying to illicit trained responses, you’re no longer sparring realistically. In a real fight you need to keep things simple and direct. Practise keeping it simple and direct in your sparring. In part 1 of this series we established that a fight is what happens when self-protection goes bad. Real fights are thoroughly unpleasant affairs that can have severe medical, emotional and legal consequences. If you therefore get the opportunity to stop fighting and run you should take it without hesitation. Many a wannabe tough guy will frown on the idea of fleeing a fight, but the smart and experienced people who have “been there” will always advise flight over fight. The true warrior doesn’t risk his life and liberty over his ego. He always does the smart thing. 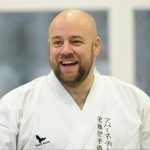 I recently had the opportunity to talk to a martial artist who a few days previously had been approached by two men armed with knives. He quickly assessed the situation and ran away. He told me that he was disappointed with himself because all he could think to do was run. He asked what techniques he could have applied in that situation. My advice was that he shouldn’t feel bad as he had dealt with the situation perfectly. His awareness was such that he had spotted the situation early enough to allow escape and he had the presence of mind to act in what was undoubtedly the right way. Fight two armed men and at best you’re going to need some serious stitching back together. Because he had run away, he didn’t even get scratched! I’m certain that anyone who understands the street would advise nothing but running in that situation. Putting distance between yourself and a dangerous situation keeps you safe and ensures you’re able to spend your time on the fun things in life. So for your sparring to be street smart, you need to practise running away. Fleeing a fight is not as straight forward as just turning tail and running. If there is a sufficient gap between you and any would be assailant, you can do just that (again, this emphasizes the importance of awareness). If, however, the assailant is close enough to strike you, or the situation has degenerated into a fight, you need confusion and distance. If you don’t have confusion and distance when you begin running, you will be giving the opponent your back. Bad things can occur when if you do that! If you have managed to incapacitate the opponent, even for a moment, then in that moment of confusion and disorientation you should flee. Because the opponent won’t be able to immediately react, you have the chance to generate sufficient distance to allow a successful escape. When a gap appears in the street, your self-protection training should have conditioned you to make it bigger. Much bigger! You should not be thinking of closing the gap and continuing the fight. Another good way to practise escaping is to have two people at either end of the dojo, while the person practicing fleeing is in the middle. The person in the middle will run towards the first person and they start sparring (using both grappling and striking). As soon as the fighting begins, the person who started in the middle must break contact and create a gap. He then runs to the other end and repeats the process. This drill is a great way to develop the skills needed to create a gap, and engrain the habit of running when you have. It’s also one hell of a work out! That’s it for part two. Part 3 sees the final part of this series where we will cover the final four ways to ensure your sparring is relevant to the street. I hope you enjoyed this article and I’d like to thank you for taking the time to read it.